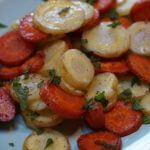 Food is best when it is simply made and this easy dish Roasted Carrots with Mint is a great example. Delicious and simple! Clean the carrots. Slice them into small coins. Drizzle with olive oil, sprinkle with salt & pepper. Place in the preheat oven for 25 minutes total until the edges are golden and the carrots are tender. Give them a good stir af 15 minutes - place them back in the oven for another 10 minutes. Remove from the oven and place on a platter. Sprinkle with mint and serve.